Only in the Bay Area can you ride up a 4,000-foot mountain to an observatory and enjoy the view under sunny, but not hot, skies in August. Mt. Hamilton seemed like the best choice today given the murky skies in Santa Clara Valley and the Lick Observatory webcam showing sunny skies and mild temperatures. I rode through downtown San Jose on San Carlos looking for the new bike lanes reported by Mr. Roadshow in the Merc. No luck. I didn’t go out of my way looking. However, there’s a photo in the Merc. I’m a bit puzzled by the design. It looks like a two-way bike lane with the dashed lines down the middle. It’s not, but it looks that way. I think it will cause some confusion. On another note, some bike lanes are going to be painted green. That seems like a good idea (as long as repainting is kept up) judging by what I’ve seen mocked up on Cycleicious. Kudos to San Jose government for trying. Downtown areas of most U.S. cities are a nightmare for cycling due to congestion. Of course, early Sunday morning isn’t bad. But I digress, a lot. On the ride up Mt. Hamilton I saw the worst outbreak of puncture vine on the road in many years. It’s noticeable all the way to the Grandview restaurant. The thorns are still attached, but in a month they’ll fall off and with a little wind could wind up in the road. The temperature fell to 58 degrees F but once past Halls Valley and beyond the fog, it went up to a pleasant 80 degrees. I was the sixth rider to the summit, arriving at 10:32 a.m. While I doubt Lick Observatory has anything to do with tonight’s landing of Curiosity on Mars, I’m sure the entire staff will be glued to the NASA website to follow the landing around 10:30 p.m. PT. This entry was posted on August 5, 2012 at 5:09 pm and is filed under News. You can follow any responses to this entry through the RSS 2.0 feed. You can leave a response, or trackback from your own site. THanks for the link love to Cyclelicious! 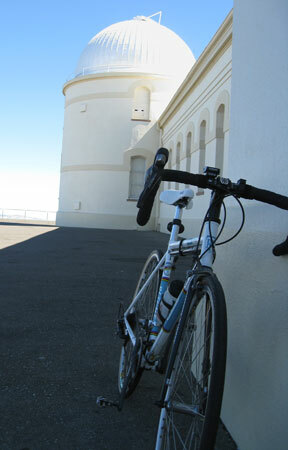 I love the ride up to the Lick Observatory from SJ. I’ve enjoyed detouring through Joseph Grant Park and take the trails partway. I wish I’d had one of your nice machines to do it on, though.